We describe the special space-time fluid-structure interaction (FSI) techniques we developed for computation of spacecraft parachute, specifically the parachutes to be used with Orion spacecraft. The core numerical methods include the DSD/SST formulation [1-4], the quasi-direct FSI coupling method [5, 6], and the stabilized space-time FSI (SSTFSI) technique . 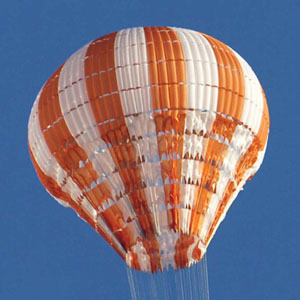 A number of special FSI techniques targeting spacecraft parachutes were developed earlier and can be found in [7-9]. The special FSI techniques describe here are from . They include methods for taking into account the line (cable) drag, techniques for building a good starting point that leads to a more robust FSI computation, a "symmetric FSI" technique that helps us build a good starting point, techniques for computing the reefed parachute shapes, and multiscale sequentially-coupled FSI techniques that help us improve the parachute structural mechanics solution. Figs. 1 and 2 show how the line drag is taken into account and the results from the computations with line drag. Fig. 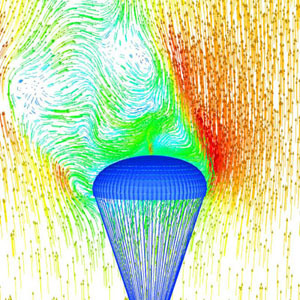 3 shows the parachute shape and flow field at an instant during "symmetric FSI" and FSI. Fig. 4 shows the flow field for the 4-gore model of a parachute reefed to 43.3%. Fig. 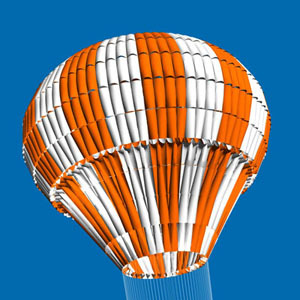 5 shows the parachute structural mechanics solution obtained with the mesh used in the fully-coupled FSI computation and with the SCFSI M2C technique and the refined structural mechanics mesh. The SCFSI M2C technique is a multiscale sequentially-coupled FSI technique (for details, see ). Fig. 6 shows the structure for the parachute reefed to 13% (Stage 2), obtained with the SCFSI M2C technique and the refined structural mechanics mesh, together with a picture from a NASA drop test. Fig. 1. Left: a cable element and relative flow directions. Right: vent and payload positions along the wind direction. For details, see . Fig. 2. Parachute FSI modeling with line drag. Parachute shape and line drag vectors. 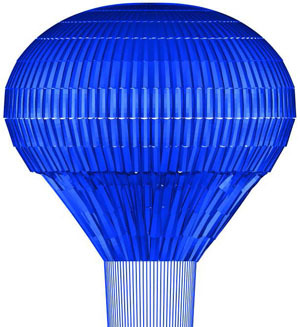 Parachute horizontal speed coupled with the suspension line orientation produces larger drag on the upwind lines. For details, see . Fig. 3. 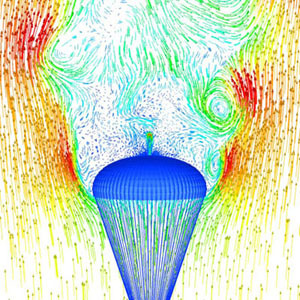 Parachute shape and flow field at an instant during "symmetric FSI" (left) and FSI (right). For details, see . Fig. 4. 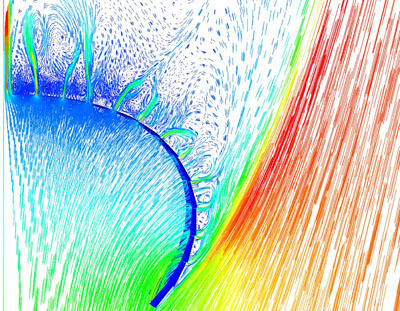 Flow field for the 4-gore model of a parachute reefed to 43.3%. For details, see . Fig. 5. 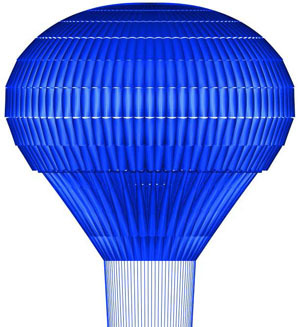 Structural mechanics solution for the parachute reefed to 13% (Stage 2). Left: obtained with the structural mechanics mesh used in the fully-coupled FSI computation. Right: obtained with the SCFSI M2C technique and the refined structural mechanics mesh. For details, see . Fig. 6. Structure for the parachute reefed to 13% (Stage 2). Left: obtained with the SCFSI M2C technique and the refined structural mechanics mesh. Right: picture from a NASA drop test. For details, see . 8. T.E. Tezduyar, S. Sathe, J. Pausewang, M. Schwaab, J. Christopher and J. Crabtree, "Interface Projection Techniques for Fluid-Structure Interaction Modeling with Moving-Mesh Methods", Computational Mechanics, 43 (2008) 39-49, doi: 10.1007/s00466-008-0261-7. 9. T.E. 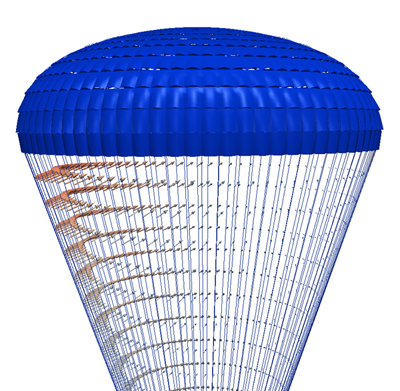 Tezduyar, S. Sathe, M. Schwaab, J. Pausewang, J. Christopher and J. Crabtree, "Fluid-Structure Interaction Modeling of Ringsail Parachutes", Computational Mechanics, 43 (2008) 133-142, doi: 10.1007/s00466-008-0260-8. 10. T.E. Tezduyar, K. Takizawa, C. Moorman, S. Wright and J. Christopher, "Space-Time Finite Element Computation of Complex Fluid-Structure Interactions", International Journal for Numerical Methods in Fluids, 64 (2010) 1201-1218, doi: 10.1002/fld.2221.